It's just one meal, on one day of the year. us the equivalent of a week's grocery budget. Don't get me wrong, I love Christmas and I love Christmas Day and having the whole family together, and I love Christmas dinner. I just don't think it has to be hideously expensive and that includes Christmas Dinner. Having strong English and Scottish roots, we enjoy a traditional hot roast for Christmas dinner – despite the fact that it can be a blazing 40 degrees! I've done the sums and walked the supermarkets to check the prices and this year our Christmas dinner will come in at under $50 again, including some treats and nibblies. We'll be having Golden Roast Chicken with gravy, glazed ham, Potato Bake, honey carrots and peas and corn. I bought the chickens last month when they were on sale for $2.99/kg and put them in the freezer. For dessert we'll have Ice Cream Christmas Pudding (my own easy version), steamed Christmas pudding (my mother's recipe), custard and cream. My Aunty Hazel always brings the pav. 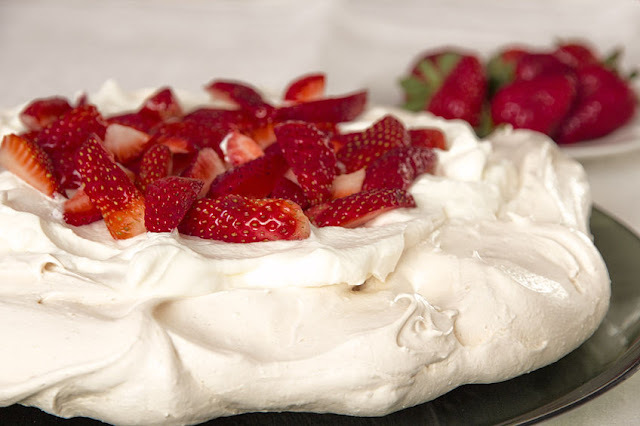 She makes the most amazing pavlovas, and decorates them so beautifully, it's almost a shame to cut into them. I can almost hear our arteries hardening. We'll have bowls of lollies and of course our traditional scorched almonds (bought a couple of months ago on half-price sale at Coles) on the table. And I'll make a couple of dips to have with carrot and celery sticks and Shapes – Barbecue, Cheese and Savoury. Shapes are a Christmas tradition for us, so when they're on half-price close to Christmas, I buy them and put them away. Of course for afternoon tea, which we include as a part of our Christmas Dinner, we'll have cake and Royal Puddings. It's just not Christmas without Royal Puddings. I've already begun searching for spearmint leaves. Since Allens's stopped making them, they've been hard to find. Last year I found then in a $2 shop, here's hoping I find them there again. If you're thinking that our Christmas Dinner is just a standard roast and dessert – you're right! It is. What makes it special is the way we set the table and the way we serve it, and of course by sharing it with family and friends. I use my best dishes and linen, including my favourite tablecloth and real linen napkins, to set the table, decorating it with a small musical Christmas tree centrepiece, bonbons and candles. Everyone gets a crystal wine glass, including the littlies. They love it, and not one glass has been broken in all the years we've hosted Christmas dinner. We're eating with people we like, the table looks lovely, we have food we all like and best of all we've spent less than Christmas dinner for one at a restaurant. With the menu being so simple, and familiar, there's no stress. All the ingredients are regulars on the shopping list, and things that I make often. This one meal, on this one day of the year, will be special. It will be extravagant. It will be delicious. And it will be stress free. 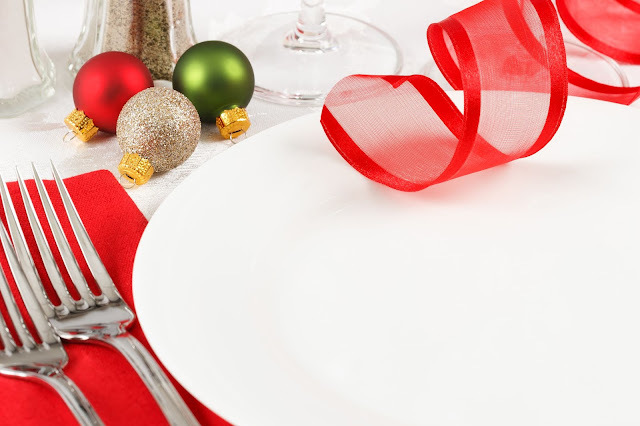 If Christmas dinner is already stressing you out, remember it's just one meal, on one day of the year. And plan accordingly. Yes, you want it to be nice. You want it to be special. But this one meal, on this one day of the year, shouldn't put you into a nervous collapse. And it shouldn't break your grocery budget either. Think about where you're going to be eating that meal. Will you be at home? Will you be at another home? Will you be travelling or camping or going for a picnic at the beach? Then think about who'll be eating that meal. Just your immediate family? Extended family and friends? Older folk or lots of children and babies? Next, what would you like to have for Christmas dinner? Turkey and roast veggies may be traditonal, but you can make your own tradition and have something else. We always have a roast for Christmas dinner, but we don't like turkey, so it's chicken, potaotes, sweet potato, onion, cauliflower in cheese sauce, beans and peas. And gravy (you've gotta have lots of gravy). For dessert we have Christmas pudding, custard, ice-cream and pavlova. Think about these things, because they are the things that will decide your Christmas dinner for you. You mentioned looking for spearmint leaves. My local Woolies have the select brand spearmint leaves for $2 a bag.